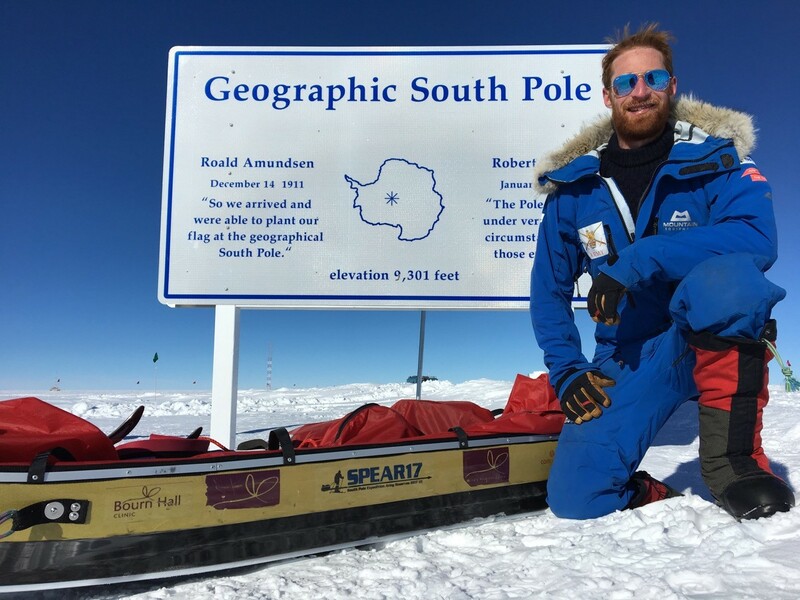 Our first ‘ice baby’, Jamie Facer-Childs, was part of the ‘South Pole Expedition Army Reserves 2017’ (SPEAR17) with five other Army Reserve soldiers and successfully crossed Antarctica to raise money for ABF The Soldiers’ Charity. Following his return home, he has kindly provided a blog for us reflecting on his incredible experience. It is now three weeks since the team and I successfully completed our polar journey. What started out as an expedition to reach the South Pole and evolved into a far more ambitious attempt to traverse the continent of Antarctica. After 1,150 miles and 66 days, five of the original six man team skied off the continent onto the sea ice of the Ross Ice Shelf. The whole experience has been a huge privilege to be a part of. It has been more than an adventure, it has been an effort of teamwork and leadership that has left a lasting impression on all of us and we have raised over £35,000 for charity. With a final charity fundraising event in May we will push towards £50,000 raised for ABF The Soldier’s Charity. I also feel hugely grateful to Bourn Hall who provided a sponsorship contribution to the expedition. But going beyond that, I owe Bourn Hall for the life they have given me. It is as I get older that I appreciate more and more how lucky I am to be living and enjoying life. After a couple of unsuccessful IVF attempts my twin brother and I were born after our embryos had been frozen down to -70! Becoming the first live births from a frozen embryo for Bourn Hall. Memories of that early freezing are non-existent but going to Antarctica and walking in temperatures of -30 to -57 has left some lasting memories. The expedition started on 15th November ’16 as our team of six was flown onto the Ronne Ice Shelf and left with our skis and sledges filled with everything we would need to survive. We started that first day excited and strong after our training. The sun shone down making it a balmy -12. We set off as we would each day, in single file, the front man navigating off the compass. Within that first hour the wind picked up and dropped the temperature to -27 stopping everyone as we dug out warmer clothing from our sledges to protect us from the cold. Spirits were high with a great feeling of joy and enthusiasm at being on this beautiful land and setting off after two weeks’ delay because of the weather. However Antarctica was going to put us to the test and threw strong winds at us for the next several days, with temperatures between -20 to -30 and we were dragging heavy sledges (130kg) for 10 hours each day. This took its toll as a couple of the team felt the strain and mentally the end was a long way away. But the team worked together and made steady progress; after passing the 3 Sails Mountains the ground was a constant uphill climb making the sledges feel even heavier. The highlight of the day was getting the tents up and getting inside. That brought shelter from the environment and signalled dinner time. The best moments during the day were spent walking at the front of the team, with an isolating view of whiteness ahead and the feeling that somewhere far ahead was the South Pole. As the initial sensation of wonderment at being on Antarctica faded the focus changed to a dedicated concentration at moving the feet onwards, sliding one ski after the other, each time a metre closer to the Pole. On occasions when the wind dropped I would ski up alongside Alex and we would pass an hour in conversation. As we progressed further inland the wind carved the ice under our feet into sastrugi. 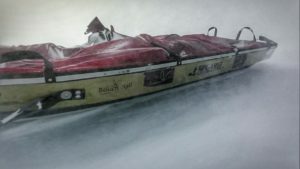 Always an uneven surface, there were areas of terrain that was constant icy ridges that the sledges needed to be pulled over and caused the skis to slip all over the place. As we moved out of an area of sastrugi it meant that we hit another uphill climb and the ground became softer, causing more drag on the sledges. Each day was a repeat of the day before with variations in terrain but our routine stayed the same. Every 60 miles covered we would all get together in one tent that evening and laugh and talk and these brought the team closer together. As we climbed we were slowly eating through our food and making our sledges lighter, but for each kg of weight from the sledge we were losing oxygen as the air got thinner the higher we got. 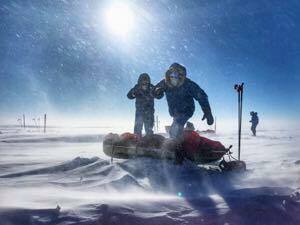 We then decided around day 31 that we would go hard and push to reach the South Pole for Christmas Day. While some of the team were more in favour of pushing hard than others because the exertion was taking its told on some more than others, everyone put in their effort for the team. Finally after 39 days 22 hours we walked into the South Pole station and were greeted by the staff there and another group of expeditioneers. What a joyous occasion – we could all now call home to our loved ones and were treated to an incredible Christmas dinner. For one team member getting to the South Pole had been tough enough and they had no energy reserves left to carry on. We said goodbye to them and they walked a short way with us as the remaining five set off to complete the expedition. After working so hard to get to the South Pole it felt like we deserved some respite. But the route in front of us was not friendly. Having climbed to 2,800m altitude at the South Pole we now had to carry on uphill for another 120 miles. It was draining as the surface we crossed was snowier which affects the slide of the sledges. The team’s progress slowed more than anticipated and the altitude rose to 3,300m. This was the high point of the polar plateau, the vast expanse of ice on top of Antarctica, the Titan Dome. Temperatures dropped to a regular -45 to -50 and the coldest day we recorded was -57. Even with all our clothing on we could still feel the cold by the end of the day. Some of these days were very quite as the team members focused on keeping themselves protected from the cold and the risk of frostbite on the face or hands was not worth it. 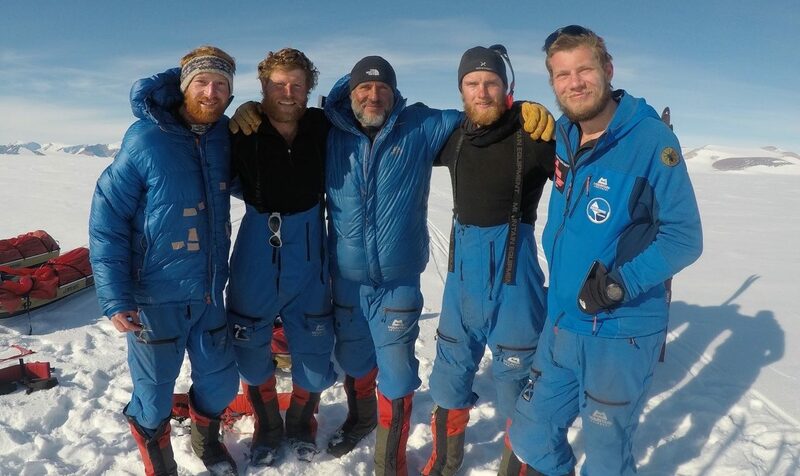 It took 16 days before the team made it to the far side of the polar plateau. Opening up in front of our eyes were beautiful peaks of mountains and we approached the Transantarctica Mountain range. What a sight, not only is it spectacularly beautiful but it also signalled an end to the harshness of the plateau and the start of our descent back down to sea level. We crested the top of the Zanefelt Glacier and spent a glorious day making progress down towards the Shackleton Glacier. The mountains either side offered some protection from the icy winds that had been hounding us and the surface was gently going downhill, making the sledges feel much lighter. It was a real relief. But as we speculated about cruising down to the finish we hit the Shackleton Glacier. It was made of hard blue ice and full of crevasses – cracks in the ice that go down and try to swallow you up. There were several near misses and feet slipped into crevasses and sometimes someone fell in up to their waist. But we quickly learnt how to read the ground and chose the best route forward. It slowed us down again and the sledges would crash around our feet on the slippery ice. Each day saw the crevasses pose new obstacles and cause us to change course. It took five days till eventually we walked out the far side of the glacier alive and well. The air was refreshing now that we were back at sea level, the sledges were almost empty now, and we skied out over the sea ice until we felt we were far enough from land to count as a complete traverse. The following day, just before the weather closed in around us, we sighted a plane in the sky. It was one of the Twin Otters and our ticket back to base camp, rest, food and company. We were received by the staff at UG base camp with champagne and looked at each other in disbelief that we were finished. You can read more about the SPEAR17 expedition at www.spear17.org.